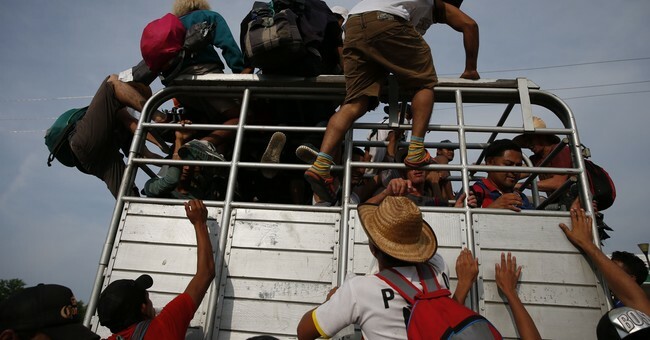 The caravan traveling from Central America to the United States on Sunday decided to take a "break" in Southern Mexico after reports of a child was abducted, NBC News reported. Those who were on the caravan wanted to keep moving forward until a vote was taken and it was decided that they would stop for the day. Tensions have been growing intense between those traveling on the caravan. Some of the illegal immigrants have relied on hitchhiking to travel between towns instead of walking the entire way. Part of the problem: as soon as seats become available, abled-body men rush to those vehicles, leaving women and children to walk. A local nun scolded the men for their actions. She also said her church arranged for five vehicles to transport only women and children to their next stop in Niltepec, about 33 miles away. A few people disagreed with the nun's assessment. "To me it's bad because there has to be equality because we are all struggling on this path," Hector Alvarado, 25, told NBC News. Rosa Bonilla, who is a single mother traveling with an almost 2-year-old and a 10-year-old disagreed that men shouldn't be allowed on the vehicles. She believes husbands should be allowed on the van as well because they help protect the women and children. "If we go alone anything could happen," Bonilla said. The Mexican government seems to be in limbo, trying to decide whether or not they should help the caravan's travelers press on or stop them from heading towards the United States. On Saturday, the Mexican government stepped in to help caravan riders for the first time. Grupo Beta, Mexico’s immigrant protection agency, gave rides to those falling behind and passed out water, The Washington Post reported. Although Mexico has created an asylum plan for the illegal immigrants, most of the caravan riders have turned down the offer. They're determined to make it to the United States. To try and force more caravan riders to apply for asylum, around a hundred federal police dressed in riot gear blocked a rural highway in southern Mexico. Police eventually let the caravan continue after Mexico's National Human Rights Commission reminded them that the stretch of highway, which lacked shade, water and restrooms, was not safe for the illegal immigrants. The caravan still has 1,000 miles to go if they go through the McAllen, Texas point of entry. If they change routes and head towards San Diego, they're looking at another 2,000 miles.